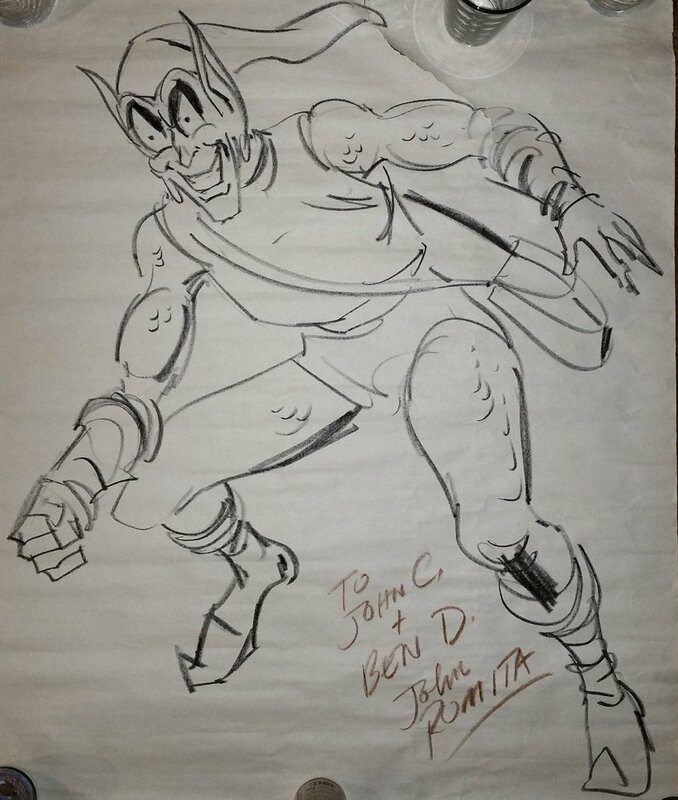 Romitaman Original Comic Book Art :: Private Collection :: HUGE Green Goblin Pinup (Early 1970s) SOLD SOLD SOLD! by artist John Romita Sr. Check out this very nice incredibly large Pinup, which was drawn entirely by the great JOHN ROMITA! This Pinup drawn in charcoal features a nice large image of The green Goblin, drawn on huge 27 by 32.5 inch drawing paper and takes up just about the entire drawing area! This piece is so large that I had to unfold it on the floor and use glass cups to hold it down to be able to take a picture of it. Art is signed and dedicated at the bottom by John Romita in his older script signature which helps date this piece to the early 1970's. There is a tear in the top of the piece which can be seen in the scan which just catches the tip of the goblin's hat, and stops at his left shoulder. This can easily be mended with clear magic tape from the back and will look great framed, hiding the tear. This art will come rolled in a tube, as it is far too large to ship flat. Just a neat piece by this great artist! ALL art on our website (including this one) are able to be purchased with VERY fair time payments, and trades are always considered towards "ANY" art on our website! Just send us an email to mikeburkey@aol.com and we can try to work something out.